Dorothy Eisenberg’s long-term commitment to the Las Vegas community is evident in her work to improve education in Las Vegas, and her dedication to the Jewish Federation of Las Vegas and the Clark County Democratic Party. Eisenberg was born in 1928 in Cleveland, Ohio. As a child, she and her family moved to Philadelphia. She graduated from high school in 1946 and two years later married Ralph Weinstein, a businessman, and together they had four daughters. In 1960, her husband passed away in an airplane crash. After his death, she decided to get a college degree from Temple University in Philadelphia while raising her four daughters. 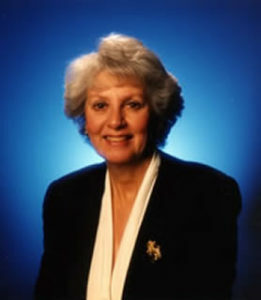 Eisenberg received her bachelor’s degree in secondary education in 1964. She met and married her second husband, Paul Eisenberg, a certified public accountant, while in school. The new family, consisting now of five daughters, moved to Las Vegas in 1964. Once in Las Vegas, Eisenberg opted to stay home and raise the children. However, she quickly became active with the newly formed Las Vegas League of Women Voters (LV-LWV). She served as president of the chapter from 1971-1973. During her time with the LV-LWV, the organization coordinated with the National Association for the Advancement of Colored People (NAACP) in a lawsuit to desegregate the Clark County schools. Eisenberg worked with the parents of school children to come up with a plan to guarantee equality in education. In 1972, Sixth Grade Centers were created in West Las Vegas, where West Las Vegas sixth-graders were bussed out to other valley schools and those children were bussed into the centers. The controversial plan enraged members of the white community and the Eisenberg family received personal threats. Eisenberg’s persistent dedication to education continues today, as she raises money for local schools through the Clark County Public Education Foundation. In 1991, a public school was named in her honor. Eisenberg is also a prominent member of the Las Vegas Jewish community. She was the first female president of the Jewish Federation of Las Vegas, which provides a voice for the Jewish community and helps various local Jewish organizations. In addition, Eisenberg is committed to the Clark County Democratic Party. She has served as the president of the Women’s Democratic Club of Clark County, working to see qualified candidates win seats in elections. Dorothy Eisenberg is an asset to the Las Vegas community, as exemplified through her hard work and commitment to public education and activism. For further biographical information, see: “An Interview with Dorothy Eisenberg,” by Caryll Dziedziak, Women’s Research Institute of Nevada, [date].